The chromaticity of an element in any visual scene is established with minimum power input to the eye when light from the element is composed of a mixture of spectral colors near 450, 540, and 610 nm. In white light, these are chromatically the most effective wavelengths for color discrimination of illuminated objects. Least-effective wavelengths are near 500 and 580 nm; these are shown to be harmful in the sense of causing confusion. Various experiments indicate that three-color response of human vision consists of well-separated channels peaking near 450, 540, and 610 nm. 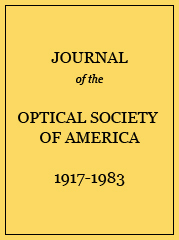 This response is related to the color-matching functions of the 1931 CIE Standard Observer and to brightness per watt of spectral colors.